Because they pay! Simple as that really. Not only are they designed and intended to save you on your monthly utility bills, but for a limited time you get money to put one in. Simple. Most people have old DUMB thermostats or do not know how to program the ones they have. Think of them like the blinking light on an old VHS. You know how to set the time, you think. You may have done it once, twice ever. Anyways, the idea is that these thermostats rely on monitors, sensors, or apps, to know when you are around. They will then from there SMARTly adjust to turning on and off as needed. Also, even learning to turn off when you are simply gone for long periods of time. Yes this is a bonus to you in not having to heat and cool your homes when not around, but also it benefits the electrical grid at large. Hence why you can qualify for a $ 125.00 instant installation rebate. This applies to ComED clients in good standing. Some other restrictions may apply. 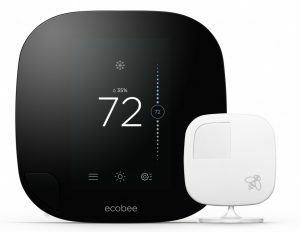 SMART Thermostat Rebates available - check with your local gas and electric providers for details. Easily adds humidity control if enough wires. Works with Amazon Echo voice control. Easy to use Mobile App - Android and Apple. Links with Nest Protect Smoke Alarm. Links with Nest Drop Cam. Can link multiple homes or systems with 1 account. Share accounts with family or nannies, without sharing passwords. Vast variety of works with Nest products (door locks, garage doors, lights, etc.). Can have up to 32 sensors. Temperature adapts to room sensors. Additional sensors add up in costs. 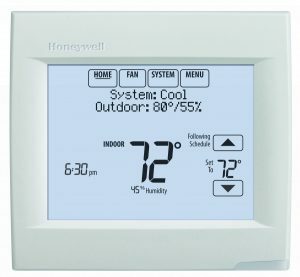 Honeywell offers a full range of industry leading touchscreen thermostats for both Residential and Commercial applications. These thermostats are proven dependent in the field and trusted by our staff for various applications. Avoid the fancy colors and hyped media, and stick with the proven best. Built in WIFI or Connect via included Bridge system. Connect to it via any internet enabled device. Works with virtually all makes and models of equipment. Integrates with many other connected devices and Z wave equipment. Available on both Android and Apple devices. 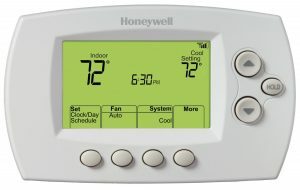 Honeywell offers a full range of industry leading thermostats for both Residential and Commercial applications. These thermostats are proven dependent in the field and trusted by our staff for various applications. Avoid the fancy colors and hyped media, and stick with the proven best. 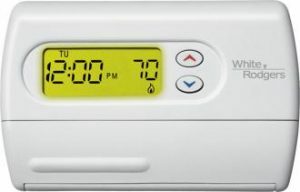 White Rodgers offers a full range of industry leading thermostats for both Residential and Commercial applications. These thermostats are proven dependent in the field and trusted by our staff for various applications. Avoid the fancy colors and hyped media, and stick with the proven best. Easy to use and program.